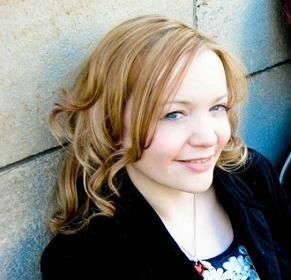 Anna MacDonald is a singer and songwriter of Celtic folk songs. She was raised in Glasgow but spent every summer on the Isle of Skye where her family's roots run deep. Her Highland connections have had a strong influence on her from an early age. She learned more from the family ceilidhs (social events with music and story telling) than she ever did in school. She has completed successful sets at the Colonsay Music Festival and the Jura Music Festival and took the opening slot at this year's Danny Kyle Open Stage for emerging talent. The songs are taken from her new album - "You hold out your hand" launched on the 17th October 2010 at Samuel Dow's in Glasgow. The Glasgow Herald said of the album: "Anna MacDonald sings Gaelic songs from her new folk album in a voice so lovely it could silence the birds of Barra", and Arc Magazine reported that "Anna MacDonald has angelic vocal tones so hair raising, it's like walking down a cobbled street with a Scottish breeze sneaking up your neck while also enticing you to sit by the warm fire and warm yourself up with a whisky discussing Scottish Culture." Anna's songs express the full variety and richness of Scottish folk music. You hold out your hand is a strophic songs with flowing melodies coloured by a touch of sadness. Ged is grianach an latha is a traditional women's working song of the kind sung to accompany repetitive tasks such as carding or washing. It has many short verses each made up of a lead line followed a chorus. Annie Bonnie is a dramatic ballad in the minor mode describing the famous female Irish pirate. Firebeach begins in a more modern idiom which is harmonically ambiguous and dissonant, and later maintains the harmonic ambiguity by moving between chords a third apart, rather than using the conventional dominant tonic relationship. Anna MacDonald performed her four songs on the 26th March 2011 and on the 3rd September 2011, accompanied by the Portobello orchestra conducted by Anthony Weeden.